Citrus quick decline is a syndrome caused by the citrus tristeza virus (CTV). It kills citrus trees quickly and has been known to devastate orchards. Keep reading to learn more about what causes citrus quick decline and how to stop citrus quick decline. What Causes Citrus Quick Decline? Quick decline of citrus trees is a syndrome brought about by the citrus tristeza virus, commonly known as CTV. CTV is spread mostly by the brown citrus aphid, an insect that feeds on citrus trees. As well as quick decline, CTV also causes seedling yellows and stem pitting, two other distinct syndromes with their own symptoms. The quick decline strain of CTV does not have many noticeable symptoms – there may only be a slight staining color or bulge at the bud union. The tree will visibly start to fail, and it will die. 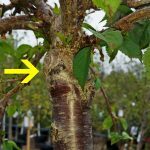 There may also be symptoms of other strains, such as pits in the stems that give the bark a ropey appearance, vein clearing, leaf cupping, and reduced fruit size. Luckily, quick decline of citrus trees is mostly a problem of the past. The syndrome primarily affects citrus trees grafted onto sour orange rootstock. This rootstock is rarely used these days precisely because of its susceptibility to CTV. It was once a popular choice for rootstock (in Florida in the 1950s and 60s it was the most commonly used), but the spread of CTV all but wiped it out. 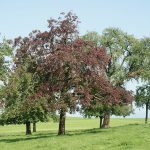 Trees planted on the rootstock died out and further grafting was stopped because of the severity of the disease. When planting new citrus trees, sour orange rootstock should be avoided. If you have valuable citrus trees that are already growing on sour orange rootstock, it is possible (though expensive) to inarch graft them onto different rootstocks before they become infected. Chemical control of aphids is not shown to be very effective. Once a tree becomes infected with CTV, there is no way to save it.